Still planning your fall break getaway? Southern Vacation Rentals has several great options for your Gulf Coast getaway. When it comes to booking your Destin vacation condo, we imagine you’re looking for fabulous community amenities, a great location, and instant access to our beautiful sugar white beaches. We hand-picked a few of our favorite Destin vacation condos for your vacation. When you’re ready to book, Southern’s reservations agents are ready! Just click the link and call the number at the top of the page, or book directly online. Leeward Key Condos – Located right on the water in Miramar Beach, Leeward Key Condos offers vacation accommodations ranging from two to four bedrooms, each sleeping six to 12 people. Every condo features a private balcony overlooking the dazzling blue waters of the Gulf. Leeward Key’s two community pools offer the ultimate in relaxation, whether you want to lounge beachside or closer to shore. You also have access to the community’s fitness center during your stay! Dunes of Crystal Beach – A stay at some of Destin’s premier luxury condos awaits! Offering four to five bedroom rentals, Dunes of Crystal Beach sits in Destin’s coveted Crystal Beach community on 255 feet of white beaches. Enjoy luxurious furnishings and plenty of space for 11-12 guests. 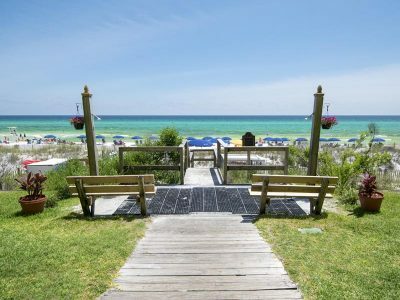 Plus, at any point, you can step out onto Destin’s beautiful beaches from the boardwalk to enjoy some fun under the sun. Each condo also features a private balcony for you to relax and enjoy the beautiful scenery. Crystal Villas – These Destin vacation condos are the perfect spot for an intimate couples getaway, with one or two bedroom options for six to eight guests. Fans of Henderson Beach State Park will love the close proximity to this beautiful slice of Northwest Florida! Crystal Villas also features direct beach access as well as a lovely garden area to sit and enjoy the serenity of the beach. Feel relaxed on your vacation with community barbecue grills and a pool for you to splash around in.